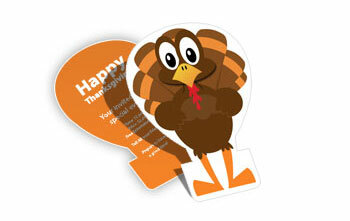 Turkey die cards are tailor made for your Thanksgiving marketing campaign. This appealing turkey die cut lets people know your business is ready to serve Thanksgiving week shoppers and holiday celebrators. The cards measure 4.75" x 6.75" and can be printed in full color on both sides. You can add a high-gloss UV coating or matte finish at no extra cost. These Thanksgiving postcards are printed on quality 14pt ultra-thick stock. You can write your message on the front, back, or both sides of the card, then distribute by mail or by hand. Our printed die cut cards are checked using a 33 Quality Checkpoint System to ensure your cards come out looking fantastic. Order with confidence knowing we back our printing with a 100% money-back satisfaction guarantee. Thanksgiving postcards are 4.75" x 6.75"
The week of Thanksgiving is a time of heavy consumer spending in many areas of the economy. Preparation for Thanksgiving brings increased travel and food spending. Over the holiday itself, many celebrate by eating out or taking in a movie. The days after Thanksgiving bring Black Friday and Cyber Monday, two of the most intense pre-Hanukkah and pre-Christmas shopping events. You can customize these cards with your logo or message. Print it on the front or back in full color. Advertise your menu, promote deals, or send a family-friendly invitation.